Julie Andrews is coming to Netflix. Today, the streaming service announced their new series Julie’s Greenroom. The preschool series comes from Andrews and The Jim Henson Company. Julie’s Greenroom will explore all the aspects of the performing arts, from acting to dance to the circus. Andrews will be joined by an all-new puppet cast as well as celebrity guests like Ellie Kemper, Chris Colfer, Josh Groban, and Carol Burnett. The new series is expected to premiere on Netflix in early 2017. Beverly Hills, Calif., June 2, 2016 – Netflix, the world’s leading Internet TV network, announced today that award-winning actress Julie Andrews will star in Julie’s Greenroom, a new preschool show from The Jim Henson Company that features an all-new puppet cast of kids learning about the performing arts. The series will be available exclusively to Netflix members globally in early 2017. Julie’s Greenroom began shooting this May in Long Island, New York. The thirteen 30-minute episodes will premiere globally on Netflix in early 2017. 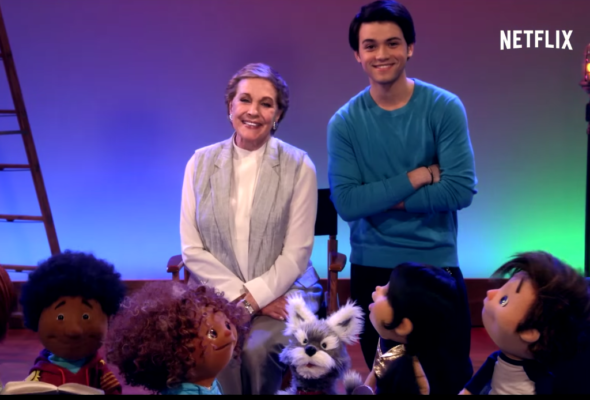 Julie’s Greenroom is a Netflix Original produced by The Jim Henson Company and is executive produced by Julie Andrews, Emma Walton Hamilton and Steve Sauer, and Lisa Henson and Halle Stanford for the The Jim Henson Company. Emmy Award(R) winning actor and writer Joey Mazzarino is co-producer and director, Tom Keniston is producer, and Emmy Award(R) winner Bill Sherman joins the series as composer. What do you think? Are you a fan of Julie Andrews? Will you or your kids watch Julie’s Greenroom? More about: Julie's Greenroom, Julie's Greenroom: canceled or renewed?, Netflix TV shows: canceled or renewed?